This program is made up of five activities; students going out into the watershed to study the behaviors, ecology, and population of shark species in florida. The prgram also includes students teaching other students about the ecology and history of South Florida's watershed and its shark species. Students present at schools and community meetings to promote a better shark awareness. The main objective of this program is to promote increased positive shark awareness in South Florida. Another objective is to provide other students with useful skills in marine science and play a role in service learning interactions. 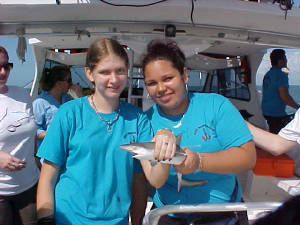 In this program, students participate in day long research trips to Biscayne Bay, Florida Bay and the Florida Keys. They study sharks in marine habitats using an ROV with a camera attached to it. The video and images they capture out in the field are uploaded onto a student designed and maintained website www.floridasharktales.net.